It is possible to think of science fiction as the literature that deals with extremes of space and time beyond our quotidian experience. If so, time seems by far the richer of the two, for it opens up the possibilities of the distant past and the even more distant future, of travel forwards and backwards in time, of alternate histories and parallel realities, of loops and traps and reiterations. Yet if time offers the greater variety, space offers greater freedom: space opens towards infinity with no necessary restrictions on where and how far we might venture; time, on the other hand, tends towards a deterministic universe of paradox and necessity. Even so, that combination of a wide range of possible devices along with the restrictions on what might be done with them, has tempted many writers during the history of science fiction, and produced many great stories. So much so, indeed, that we are regularly presented with weighty anthologies that variously claim classic or definitive status. The latest in this very long line is The Time Traveler's Almanac , edited by Ann and Jeff VanderMeer, an editorial team already familiar with mighty tomes that have good cause to be thought definitive (one thinks, for instance, of The New Weird (2008) and The Weird (2011)). Unfortunately, though it is every bit as heavy as The Weird , I don't think this new anthology quite matches its predecessors. This is partly because no one anthology, no matter how extensive, could hope to contain all of the great time travel stories; but mostly it is because of a series of editorial decisions that seem, to my mind, questionable. Like The New Weird , this volume combines fiction (64 stories and one novel extract from a total of 62 writers; there is one collaboration and Geoffrey A. Landis, Kage Baker, Gene Wolfe, and Harry Turtledove are represented by two stories apiece) with non-fiction. However, where The New Weird engaged in an argument about the nascent sub-genre, exploring with relish questions about what constituted the new weird, how it had developed and so forth, The Time Traveler's Almanac is a very different beast. The longest of the articles, "Music for Time Travelers" by Jason Heller, consists of little more than an annotated list of popular music that has science fictional overtones, most of which are at best tangentially associated with time. At no point does Heller use music to cast a light upon time travel as represented in literature or film, or indeed give us anything deeper than "these are bits of music I like that I can squeeze into a time travel themed article." Not that his piece is any worse than Genevieve Valentine's "Trousseau: Fashion for Time Travelers," or Charles Yu's "Top Ten Tips for Time Travelers" (rule 2: forget any rules). 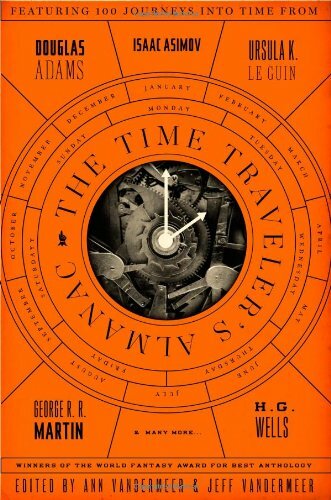 Only "Time Travel in Theory and Practice" by Stan Love begins to grapple with some of the ideas of time travel, or at least to touch some of the more familiar bases (Einstein's Relativity, Kip Thorne's wormholes). But with the exception of Love, there is a casual, superficial, almost jokey approach in the non-fiction that suggests that none of this is taken too seriously. Yet the fiction, or at least the majority of it, demands to be taken seriously. The book is divided into four themed sections, though these are so broadly and rather crudely defined that they could be used to cover just about anything, and they are employed so loosely that most of the stories feel as though they really belong elsewhere. The volume opens, ill-advisedly to my mind, with "Experiments": "Stories in which individuals or organizations are experimenting with time travel or are subjects of experimentation" (p. viii). This definition allows the editors to fit in an extract from The Time Machine by H. G. Wells, which is, when you think about it, a very good place to start any survey of time travel stories, except that this piece comes close to the end of the section, almost an afterthought, and most of the rest of the stories that make up this section are either rather dull or approach the theme of the anthology so obliquely that they might belong in a different book altogether. Thus the opening story is Richard Matheson's "Death Ship" from 1953. It is as mechanistic as much of the SF of that period was, and the story of a spaceship crew trapped in a Flying Dutchman-like situation on an alien world is flat, unconvincing, and only tangentially related to time travel. It is, in other words, hardly the most inspiring way to begin an anthology. The very next story, however, "Ripples in the Dirac Sea" by Geoffrey A. Landis, a staple of time travel anthologies, is a harbinger of the very good things to come. Other excellent stories in this section include "Triceratops Summer" by Michael Swanwick, in which the residents of a small town find themselves in a loop outside of time when dinosaurs begin to graze their fields, and "The Gernsback Continuum" by William Gibson, which is, to my mind, the very best story about science fiction ever written. However, we also get "Pale Roses" by Michael Moorcock, one of his baroque Dancers at the End of Time sequence, in which time travel is just one among several bits of extravagant set dressing which plays no substantial part in the plot (one character arrives from the past, but we see little to make us believe that the two times are particularly different; certainly our traveler doesn't evince much shock of the new). Why the editors chose this story rather than Moorcock's much better and far more pertinent "Behold the Man" is hard to imagine. There is also "Another Story, or A Fisherman of the Inland Sea" by Ursula K. Le Guin, which is as finely written and as thought-provoking as Le Guin's fiction usually is, but to be honest I found the time travel elements rather ponderous because her main focus is on the complex marital arrangements at the heart of the story. The first section closes with another curious editorial choice: "Young Zaphod Plays It Safe" by Douglas Adams. Set some time before the events of The Hitchhiker's Guide to the Galaxy , it tells of the part Zaphod Beeblebrox plays in the salvage of a wrecked spaceship during the course of which we discover that the most dangerous thing in the universe, a "Reagan," is heading for Earth. It’s not vintage Adams, but it's a perfectly acceptable story, except that it contains not one single jot of time travel. Did the editors just want to attach Douglas Adams's name to their enterprise, or did they assume that because it is set in space it must be the future, and so the reference to Reagan automatically implies time travel? Either way, the story contributes to the sense that this is a very unsatisfactory way to start the book. The second section, "Reactionaries and Revolutionaries"—"Stories in which people are trying to protect the past from change or because (sic) they are curious tourists or academicians and want to accurately document different times" (p. ix)—is much better, and would have made a far more sensible opening to the volume, if only because it begins and ends with some of the great classics of time travel literature which illustrate better than anything we have seen so far the challenge and the daring of the sub-genre. The first story here, for instance, is Ray Bradbury's "A Sound of Thunder," without which any serious survey of time travel literature would be incomplete (though I remain skeptical about the VanderMeers' claim that the idea of a time traveler stepping on a butterfly in the time of the dinosaurs and thus altering the whole of history is the origin of the Butterfly Effect). It is followed immediately by "Vintage Season," here ascribed to both Henry Kuttner and C. L. Moore. This is the story of a man in California who finds his home taken over by time travelers from the future come to witness an imminent disaster. Here, in these two pieces, we see at once why such stories can be so exciting for both readers and writers. It is a pity, therefore, that these two stories are followed by John Chu's "Thirty Seconds from Now" and Harry Turtledove's "Forty, Counting Down," which together undermine the good work that has just been done. Chu's story is a very slight tale of homosexual romance dressed up with a rather inconsequential metaphor about foreseeing the future. Turtledove's story is simply overlong and tedious. The hero is a 40-year-old man who just happens to look exactly the way he did twenty years before; his marriage has broken up, so he invents a way of traveling back in time to replace his younger self and woo his future wife more ardently so that the break-up will never happen. The logic of the story doesn't make sense (for the origins of the break-up he needs to look much closer to home than when he and his girlfriend were just getting together), and Turtledove bulks out the story by piling on contemporary cultural references rather than doing anything like developing character. The tedium of the piece is compounded later in the anthology when we are presented with "Twenty-One, Counting Up," which tells exactly the same story except from the point of view of the younger version of the hero. It doesn't make any more sense this way around, and the simple repetition of plot adds absolutely nothing of any substance to the story. Even if a case could be made for including "Forty, Counting Down," and I'm not sure it does anything particularly original in terms of time travel (Turtledove has built practically his whole career on time travel and alternate history, and there are many far better examples of his work that could have been chosen instead of this), then I remain absolutely unconvinced that there is any justification for also including "Twenty-One, Counting Up." The Turtledove isn't the only curious doubling in this volume. Here, within a few pages of each other, we get "Noble Mold" by Kage Baker, closely followed by "A Night on the Barbary Coast" by Kage Baker. Both are, of course, stories of the Company; both feature the same two characters in the same edgy relationship; both are set in California, one around the beginning of the nineteenth century, one a little later at the time of the gold rush; both involve Mendoza on a quest for the Company being assisted by the bemused narrator; in both cases the quest goes wrong then is put right again; end of story. They follow exactly the same template, so it is only in minor details of the setting that they can be told apart at all. They are not necessarily bad stories, but we certainly don't need both of them. However, the false note sounded by these stories is more than offset by some of the pieces around them. "Fire Watch" by Connie Willis is perhaps the best single story she has written, and within its few pages tells us more about the London Blitz than she managed in all the interminable diptych that was Blackout and All Clear (2010). "Time Gypsy" by Ellen Klages is, in one sense, fairly conventional in its handling of time travel tropes, but it uses the story to make points about the homosexual experience that are far more powerful and affecting than John Chu has managed. And Garry Kilworth's wonderful "On the Watchtower at Plataea" tells of a siege in ancient Greece being observed by two rival time travelers, one from the future and one from the past, who find themselves drawn into their own inexplicable duel. The section ends with a truly great story: "Enoch Soames: A Memory of the Eighteen-Nineties" by Max Beerbohm. Soames dreams of literary greatness, but his febrile offerings disappear instantly into oblivion, so he makes a deal with the devil to travel forward one hundred years to the British Library to see how the interval has polished his fame, only to find when he gets there that his name lives on only in Max Beerbohm's account of his deal with the devil. It is a gloriously intricate story with fascinating postmodern elements avant la lettre , and the story has attracted such an enthusiastic following over the years that on the day Soames was due to appear in the reading room of the British Library an audience gathered to witness the event. "Enoch Soames" has not been as widely reprinted in time travel anthologies as it deserves to be, so its appearance here is a cause for genuine celebration. The third part, "Maps and Traps"—"Stories in which the paradox of time travel is front-and-center, and characters become trapped in those paradoxes" (p. ix)—brings in the most familiar element in the time travel story. But it is also the most hackneyed, and the most restricted (the very last story in the anthology, "Palimpsest" by Charles Stross, which is filled with very knowing nods to the clichés of the sub-genre, begins with the protagonist murdering his own grandfather), which may be why there are fewer really stand-out stories in this section than anywhere else. The best of the bunch by some distance is "Yesterday Was Monday" by Theodore Sturgeon, in which an ordinary man discovers that the whole of existence is just a stage set when he wakes up on the wrong day and finds the props of his daily life haven't been finished yet. It's not really a paradox story (I think there are fewer paradoxes among the seventeen stories in this section than there are in the rest of the collection) but it is a very inventive take on the idea of time as a trap. Something of the same notion is literalized in "The Great Clock" by Langdon Jones, in which a solitary man spends his days oiling the mechanism of the clock that controls the whole of existence. Unfortunately, like rather too many new wave stories of the same era, Jones spends all his time describing the situation without really developing it as a story. There are interesting curiosities in this section. For instance, I had not previously encountered "The Clock That Went Backward" by Edward Page Mitchell, which was first published in 1881, an odd piece in which a clock that goes backwards somehow transports two modern-day Americans back to sixteenth century Holland where they perform the actions that make their own nineteenth century existence possible. It is not a particularly good story, the writing is rather woolly in places so it is not always clear what is going on, but it has a certain historical interest even though it is emphatically not the first time travel story ever published as the VanderMeers claim (for that we can go back at least to Washington Irving's "Rip Van Winkle" (1819) if not earlier). What was innovative in Wells's The Time Machine was the invention of a device that allowed the protagonist to move at will through time, and that was most certainly absent from Mitchell's story. Actually, the time travel in "The Clock That Went Backward" owes more to magic than to any human or scientific intervention, something that seems surprisingly prevalent in these supposedly science-fictional stories, from the appearance of the devil in "Enoch Soames" to the central role of an ever-changing god in "The Mask of the Rex" by Richard Bowes. Other than the Sturgeon, the only story in this section that really displays the ingenuity we tend to associate with time paradox tales is Kim Newman's neatly constructed "Is There Anybody There?". A medium using a Ouija board in the 1920s somehow finds herself talking with a sleazy computer hacker in the present day, but cleverly turns the tables on him. It isn’t what we might normally consider a time paradox but it is a well-devised trap, and much the same is true of the better stories in this section. "Delhi" by Vandana Singh tells of a young man who can glimpse the past and future of his city, a situation that leads him to suicidal despair until he attracts the attention of an enigmatic figure who may understand what is going on. Whether the trap in this instance is anything other than the failure of the protagonist to adjust to his own circumstances is a moot point. "Terminós" by Dean Francis Alfar offers, without explanation, the idea of a man who buys and sells bits of time; kids with time to kill can make a little cash on the deal, a lonely widow can buy some romantic memories. There is a story in here, though it is considerably less interesting than the basic situation; but the whole thing is, at least, memorable, which is more than can be said for most of the offerings; they slip from our grasp almost before we have finished reading them. There are other stories in this section that stand out: "Lost Continent" by Greg Egan, which is a heartfelt complaint about the way we treat refugees today, although the time travel element in the story is almost completely irrelevant, and "The Waitabits" by Eric Frank Russell. Russell's best work tended to feature sly, generally comic ways of tweaking authority, and this is no exception. It begins with a cruelly satirical take on the exploitative, colonialist mindset that lay behind much of the science fiction of his day, then comprehensively undermines this by introducing his explorers to a world that cannot be dominated, cannot be exploited, because its natives operate within a very different timeframe. The final section is "Communiqués": "Stories about people trying to get a message to either someone in the past or in the future—out of their own time" (p. ix). As ever, this is interpreted so loosely that it allows just about anything into the mix. Thus, for instance, we have "Swing Time" by Carrie Vaughn, in which a pair of adventurers travel through time to commit robberies while being pursued by an intertemporal police force. There is also "Bad Timing" by Molly Brown, in which a young man in the future reads an old magazine story that describes him going back in time and meeting the woman who wrote the story, so he decides to travel back and make the story true, but because he cannot operate his time machine properly he keeps missing the actual date. Both are, if you stretch a point, stories of communication across time, but more noticeably they are both romps that play with the clichés of time travel without actually doing anything startlingly original with them. They are fun and effective, and more properly belong among the paradoxes and traps of the previous section. There is communication in E. F. Benson’s "In the Tube," but is there time travel? As well as writing the hugely successful Mapp and Lucia social comedies, and being Mayor of Rye, Benson was a highly acclaimed author of Jamesian ghost stories, and that is precisely what this is. It's a powerful piece of work that can, at certain moments, make the hairs at the back of the scalp stand on end, but glimpsing someone's death ahead of time is quite a formulaic element in ghost stories of this vintage and isn't usually considered a form of time travel. There are a couple of good stories here. "3 RMS, Good View" by Karen Haber is another staple of time travel anthologies and, like Landis's "Ripples in the Dirac Sea," takes its protagonist back to the hedonistic days of San Francisco in the 1960s, which is, I suppose, part of the appeal. And "Loob" by Bob Leman, after a shaky start in which the story doesn't quite come into focus, turns into one of the better pieces in the collection. It tells of Loob, a brain-damaged boy with strange powers who somehow wreaks havoc on the pre-lapsarian world of half a century before, and of the one person who knows what Loob has done, and what he himself has lost as a result. In the main, though, there are too many stories that play with familiar ideas of time travel without extending those ideas or presenting anything new. "The Time Telephone" by Adam Roberts cobbles together three disparate ideas around the central theme of a telephone that allows us to speak to the future or the past, but it doesn't mold these ideas into a coherent whole. Others, "At Dorado" by Geoffrey A. Landis, "The House That Made the Sixteen Loops of Time" by Tamsyn Muir (a piece more notable for its title than its content), "Domine" by Rjurik Davidson, make almost no impression at all. Looking across the collection as a whole, it is in general the older stories by the more established writers, Landis, Gibson, Wells, Kuttner and Moore, Bradbury, Beerbohm, Sturgeon, Russell, that tend to be more radical, more innovative in their approach to time. Too many of the newer writers seem content to rest on the familiarity of time travel, and hence work minor variations on a theme rather than producing anything big enough and bold enough to make us sit up and take notice. This isn't invariably the case. In "Traveller's Rest", for instance, the underappreciated David I. Masson comes up with a stunning idea in which a soldier sent home from the front line finds that everything expands, time, space, even his name, the further he gets from the war; yet when, years later, he is recalled to battle he finds that only seconds have passed at the front. It is, as I say, a great idea, though I'm not convinced that the execution does it full justice. On the other hand Gene Wolfe, who is experienced enough to know better, comes up with one of the tiredest and least interesting stories in the book in "The Lost Pilgrim." In this story, a time traveler sent back to travel with the Pilgrim Fathers (though his memory of his own identity is so vague that even this is open to question) finds instead that he is traveling with Jason and the Argonauts. The problem is that Wolfe tells the story of Jason's voyage absolutely straight. As in the Latro novels, proper names are distorted so that Jason is disguised as "Eeasawn," but events don’t differ from the legend by one iota, and having the narrator lost in time doesn't color the events or add a revealing perspective in any way, shape, or form. Time offers so many possibilities, so many variables, that it must be impossible to concoct a collection of time travel stories that is entirely bad. There are excellent stories scattered throughout this anthology, stories that can be read with pleasure time and again, stories that belong in the library of anyone with an interest in science fiction. But there are equally many mediocre stories, stories that do not reward the reader with the surprising shifts of perspective or breathtaking twists of understanding that we expect of the best time travel tales. There are too many stories content to tread water, to offer minor variations on a familiar theme rather than startling us by finding another way to turn time inside out. And in an anthology of this size, that is a disappointment. One thing is sure, we are still awaiting the definitive collection of time travel stories.